SUMMARY: A 35-year-old man with polyostotic fibrous dysplasia and a massively enlarged skull presented with Lhermitte sensations due to an unstable, mulitseptated, lytic C2/3 vertebral body complex. Enlarged extracranial vasculature made open surgery a high-risk option and limited percutaneous access. A 5F catheter was directed by using a guidewire into the C2/C3 vertebral body complex via a transpedicularly placed biopsy cannula to ensure polymethylmethacrylate deposition throughout the lytic compartments of the vertebral body complex. Percutaneous vertebroplasty (PV) is successfully used to treat pain due to vertebral compression fractures via percutaneous injection of polymethylmethacrylate (PMMA) with a high success rate and few complications.1 At the cervical spine, it can be performed with an anterolateral approach between the proximal airway and the carotid space1,2 or a transoral route.3-5 This case report presents a novel approach in a patient with limited access to the upper cervical spine in which the Seldinger technique was used to advance a catheter to the superior portion of a vertebral complex, filling the lesion with PMMA from top to bottom. A 35-year-old man with McCune-Albright syndrome and severe polyostotic fibrous dysplasia involving multiple bones and craniofacial deformity with leontiasis ossea presented for the management of neck pain with progressive upper extremity radiculopathy and quadriparesis. He had occasional presyncope with cervical motion and manually supported his head, to avoid symptoms. He was fitted with a skeletal occipital mandibular immobilization (SOMI) device while treatment options were reviewed. Neurologic examination revealed limited range of cervical motion and positive Lhermitte sign with pain and lightheadedness. The patient had both positive Spurling and Hoffman signs bilaterally. Pinprick sensation and proprioception were affected in all extremities. His upper and lower extremity strength was mildly affected more on the right than on the left side. Hyperreflexia was present throughout. A CT myelogram and conventional radiography (Fig 1) demonstrated C2–C3 fusion with a septated lytic expansile lesion within the fused vertebral bodies and a pathologic fracture along the anterior and inferior portion of the vertebral body complex. Cervical cord atrophy was present at the C1 level where there was a C1–C2 subluxation and an os odontoideum. Instability at C1–C2 and/or craniocervical junction, as well as micromotion due to C2–C3 complex fracture, were likely responsible for the patient’s symptoms. It was felt that the brittle fused C2–C3 complex was unstable in view of a massively enlarged skull, making this patient prone to fracture with cord injury. Cervical vascular anatomy was evaluated preoperatively with CT angiography (CTA; Fig 2A) and conventional angiography. Enlarged external carotid artery branches and vertebral arteries supplied the massively enlarged and thickened skull of the patient. Lateral conventional radiograph of the cervical spine (A), sagittal postmyelogram CT reconstruction of the cervical spine (B), and axial (C) postmyelogram CT scans of this patient with a multiseptated (black arrows) C2–C3 vertebral complex (arrowheads) and disruption of the anterior wall of the vertebral body (white arrows). Note os odontoideum (OS), cord atrophy, and anterior subluxation of C1 on C2. The anterior and posterior spinal laminar lines are outlined. CTA (A) indicates that the carotid artery branches (short arrows) and jugular veins (arrowheads), as well as branches of the right occipital and vertebral arteries (long arrows), obscure access to the involved vertebra. Intraprocedural CT demonstrates access to the C2/C3 vertebral complex via a relatively less vascular route (B). The patient was at risk of a C1–C2 level quadriplegia. Surgical options included a combined anterior and posterior occipitocervical fusion. Substantially enlarged vasculature surrounding the head and neck combined with the unique anatomy in this patient made surgical management challenging. Because of the risks involved with anterior surgical stabilization of the cervical spine, percutaneous vertebroplasty (PV) was considered. The patient was premedicated with 1 g cefazolin. Under general anesthesia and neurophysiologic monitoring, an 11-gauge trocar-cannula needle (Osteo-Site, Cook, Bloomington, Ind) was advanced into the C3 vertebral body through the left C3 pedicle via a posterolateral approach by using CT (Picker PQ 2000, Picker International, Cleveland, Ohio) guidance (Fig 2B). The supine position, with the patient’s head tilted, was used instead of the prone position to avoid risk for cervical spine subluxation. CT guidance was preferred over fluoroscopy because the patient’s extensive fibrous dysplasia of the skull hindered adequate visualization of the C3 pedicle under fluoroscopy. Furthermore, there was risk for inadvertent puncture of the extensive vasculature surrounding the upper cervical vertebral segments, and the presence of bone hypertrophy left only the left pedicle of C3 readily accessible for puncture (Fig 2). A percutaneous approach was preferred over a transoral route because of potential risks of infection with the transoral route. The patient was then transferred to a biplanar angiography suite (Neurostar T.O.P., Siemens, Erlangen, Germany). A 65-cm 5F JB1 catheter (Cook Medical) was fashioned by cutting off the distal 1 cm of its tip and advanced through the cannula. The back end of a 0.035-inch, 145-cm length, Amplatz Superstiff guidewire (Boston Scientific, Natick, Mass) was curved and advanced through the catheter. By using the Seldinger technique, the catheter was fluoroscopically guided into to the superior aspect of the C2–C3 vertebral lesion complex (Fig 3). 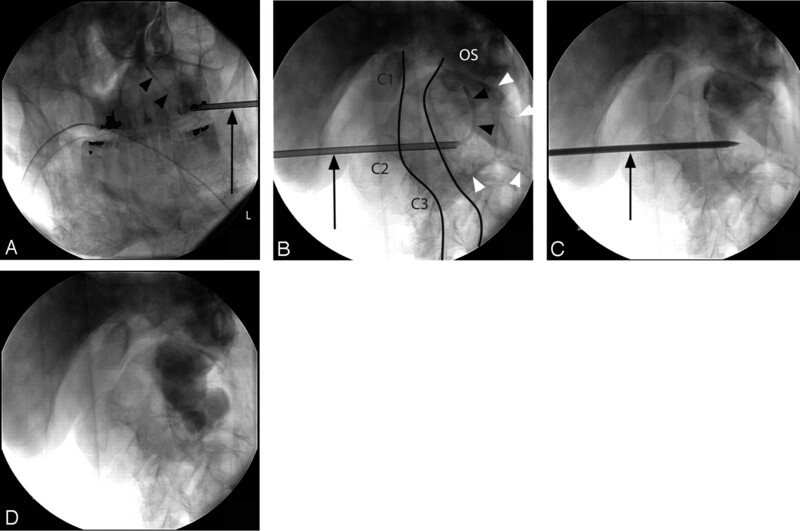 Intraosseous venography showed no contrast extravasation into the spinal canal. The PMMA mixture was prepared by using Codman Cranioplastic, Type 1 (CMW Laboratories, Blackpool, England) mixed with 1 g vancomycin powder (Abbott Laboratories, Abbott Park, Ill) and 6 g barium sulfate (E-Z-EM, Westbury, NY) into a thin consistency. PMMA mixture was then injected under continuous fluoroscopy into the osseous complex via the catheter by using 1-mL Luer-Lok Medallion syringes (Merit Medical, South Jordan, Utah). PMMA was first directed into the superior aspect of the C2 vertebra, with additional bone cement into other compartments of the fused C2 and C3 vertebrae by using a second catheter. Once the catheter was removed, additional PMMA was injected through the cannula until a full column of PMMA filled the C2–C3 osseous complex. A total of 7 mL of bone cement was used. Postprocedural unenhanced CT showed a column of cement formed from the top to the bottom of the lesion, without evidence of leakage (Fig 4). AP (A) and lateral (B–D) intraprocedural fluoroscopic views demonstrate cannula (arrows) and catheter (arrowheads) placement into the superior aspect of the C2 vertebra (A and B). As in Fig 1A, the anterior and posterior laminar lines are outlined, the C2–C3 vertebral body complex is outlined with white arrowheads, and C1, C2, C3, and the os odointoideum (OS) are labeled. Figures 3B–D have the same projection. Figure 3C demonstrates successful placement of methylmethacrylate within the superior aspect of the C2–C3 vertebral body complex. Figure 3D demonstrates a continuous column within the C2–C3 vertebral complex. Postprocedural conventional radiographic and CT scans obtained in similar locations as in Fig 1. Note the deposition of the bone cement in multiple compartments of the vertebral complex and the tract of the cannula (arrowheads). The patient’s neck pain, paresthesias and lightheadedness resolved 1 week after the procedure. His extremity strength and cervical range of motion improved, and by the fifth week he no longer required a neck brace. He continued to improve. By the 6-month visit, he was able to perform yard work and other activities of daily living. Surgical intervention has been postponed. This case is unique because polyostotic fibrous dysplasia and unusual patient anatomy led to the decision to use a catheter-directed method for transpedicular deposition of PMMA in a fused C2–C3 vertebral body complex rather than previously described methodologies.3-7 In light of the complex anatomy in this patient, CT guidance allowed safer placement of the cannula. The ability to direct the catheter into various compartments of the multiseptated C2–C3 vertebral body complex allowed more precise injection of PMMA throughout the vertebral body and multiple injections from the same cannula by using different catheters, in the event that bone cement would not be able to form a continuous column of bone cement if only injection via one cannula was possible. A continuous column was necessary to improve stability in this patient who had a pathologic fracture of the C2 and C3 vertebral body complex. General anesthesia was used to avoid the potential for spinal cord injury with inadvertent patient motion. There was no complication, and the patient had stable pain relief and neurologic improvement by the 6-month follow-up. A 13-gauge, instead of an 11-gauge, needle is typically used in the cervical spine but may increase the difficulty of cement injection.7 Before the procedure the height and width of the intended pedicle were measured to ensure that it was at least 5 mm in each dimension perpendicular to its length. Less than 5 mm in each dimension has been found to lead to increased risk of vertebral artery injury in the placement of 3.5-mm screws through the C2 isthmus.8 CT guidance was used to ensure accurate placement of the needle cannula. A search through the English-language literature by using PubMed and Medline found no published accounts of cervical vertebroplasty in the setting of fibrous dysplasia. A recent case report discussed the use of kyphoplasty in a patient with polyostotic fibrous dysplasia of the thoracic and lumbar spine.9 The authors noted that access to the cystic area of the lesion was met with minimal resistance, whereas greater than normal force was required to pass instruments through harder osseous spicules and septations. When percutaneous vertebroplasty is used in the management of neoplastic lesions, transpedicular access has been advocated only through the unaffected pedicle,10 though other investigators have found no complication with the transpedicular approach via the affected pedicle.11 In the case presented here, the pedicle was primarily selected for ease of needle and catheter placement even though it was involved. Interactions between the polyethylene JB1 catheter and the PMMA have not been reported. The heat generated from exothermic reaction produced by the PMMA is not expected to degrade the integrity of the catheter but does have the potential to reshape the catheter. Inspection of the catheter following the procedure did not reveal any grossly visible loss of catheter integrity. In summary, in a unique patient with polyostotic fibrous dysplasia the feasibility of directed PMMA injection by using a wire-guided catheter via a traspedicularly placed needle is illustrated. Accepted after revision March 21, 2006.